Sitting on the edge of beaches, bush, outback and some seriously good wine country, the South Australian capital has something for everyone. Spread out on a broad plain between expansive white sand beaches and rolling green hills, Adelaide is known as the ‘20-minute city’ for its quick access to both. The compact city center is easy to navigate on foot, and its laneways are home to vibrant bars and chic restaurants that take advantage of the abundant local produce. The pedestrian-only zones of parallel Leigh and Peel Streets are abuzz with trendy restaurants and small bars. Sit around the grill at yakitori bar Sho, settle in at an opulent cocktail bar like Maybe Mae or try everything from tequila to burgers to Basque-country snacks at Udaberri. Franklin Boutique Hotel has seven simply furnished rooms. The Adina Apartment Hotel Adelaide Treasury is housed in a grand historic building. The elegant Mayfair Hotel has an opulent rooftop bar. Orana is Australian cuisine at its finest. Voted best restaurant in 2018 by Gourmet Traveller magazine, Orana has helped redefine Australian cuisine through its creative use of native ingredients. The degustation menu at this intimate 11-table restaurant features 16 to 18 courses blending ancient and modern Australian cuisine and a wine list of trendy natural numbers and international classics. South Australia is known as The Festival State and its packed calendar of events reaches its peak in February and March when the Fringe and Adelaide Festival turn the city into Australia’s cultural hub. Green spaces are transformed into pop-up bars and performance spaces, and the city buzzes with sequined performers, sleep-deprived revelers and dressed-up opera goers. It’s the busiest time of the year, so book well in advance. Get up close to some cute Aussie creatures at one of Adelaide Zoo’s animal encounters; go behind the scenes of the koala exhibit to meet resident koalas Sophie and Louise, or camp out overnight on a wild night experience, going on a night safari (many Australian marsupials are nocturnal) and falling asleep to the sounds of the wild. Picture touring through winding roads, rolling hills of orchards and vineyards interspersed with charming villages less than 20 miles from Adelaide’s city center. Welcome to the good life that is the Adelaide Hills. This easy-to-access region could not be better placed for a leisurely side trip. Turn down any leafy lane and you’re likely to find a cheese maker, chocolatier, artisanal bakery or craft distiller. Not into seeking missions? Tasting trails link producers throughout the region, and on the weekend you can also find their produce at abundant local farmer’s markets. Get back to basics at CABN, an off-grid cabin surrounded by 180 acres of woodland and wildlife. The minimalist accommodation has all the creature comforts but with no wi-fi, it’s the perfect place to unwind and get in tune with nature. In the village of Uraidla, Lost In A Forest dishes up delicious wood-fired pizzas in a cozy former church. Expect irreverent toppings and trendy natural wines from nearby Basket Range and further afield. 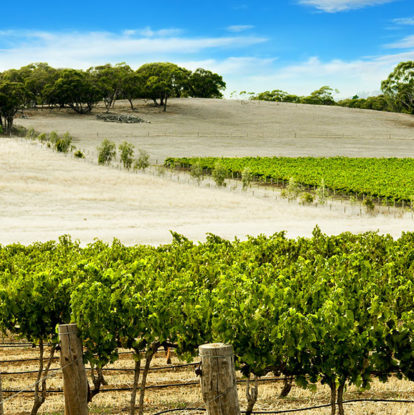 An hour’s drive north of Adelaide, the Barossa Valley is Australia’s premier wine region. Blessed with some of the world’s oldest vines and famous for its full-bodied reds, there are now a range of experimental wine makers adding new layers to the tradition. With over 80 tasting rooms (known as cellar doors in Australia), there’s no shortage of wineries to visit but the best glass might just be a sparkling wine sipped during a hot air balloon ride over the scenic valley. Surrounded by olive groves and rolling vineyards, The Louise’s luxurious suites are the perfect spot to relax, or the boutique lodge offers guests unique experiences such as a picnic breakfast surrounded by kangaroos and the chance to blend your own wine. Fino at Seppeltsfield is a pioneer of regional dining in South Australia and showcases sustainable, seasonal produce in the winery’s 1850s bottling hall. The custom-made settings come from the adjoining Jam Factory where glass blowers, sculptors and metalworkers create and exhibit their wares. Home to an ancient Indigenous culture tens of thousands of years old, as well as spectacular gorges and rocks that glow red in the setting sun, this mountain range on the edge of the outback begins just a three-hour drive north of Adelaide. Spanning over 62 miles of the Ikara-Flinders Ranges National Park, the natural amphitheater of Wilpena Pound is a breathtaking sight, created from a mountain range eroded over millions of years; the best way to really appreciate its vast beauty is from above on a scenic flight. Wilpena Pound Resort is the only accommodation within the national park, offering visitors the choice of comfortable resort rooms, a camping site, and the star of the show, glamping at Ikara Safari Camp. On the other side of the Pound with magnificent views of three mountain ranges is the old sheep station turned accommodation for all budgets, Rawnsley Park. The Eco Villas have glass roofs to make sure you sleep under a million stars. Try the Feral Mixed Grill (emu, kangaroo, camel and goat) at the Prairie Hotel. The best of South Australia: 6-day Adelaide, Barossa Valley and Kangaroo Getaway from USD$1,002pp*.